This is my very first time at posting on a forum so apologies if I post in the wrong place or you can't see my photos. I bought SETUP 1.35 from Nando which was a godsend as I couldn't have got this build up and running without it. Saying that it still wasn't easy. I couldn't use the compaction part of the program due to I think my TOLUD being 3.75GB so my only option was to do the DSDT fix.A quick scan of the guide and I just thought "there's no way I'm going to manage this!" but I slowly worked through the guide and it wasn't as bad as I thought even though have the time I didn't have a clue what I was doing.Anyway, I used the Intel method. Encountered 1 Error that was easily fixed so put my aml file into config folder in the ram disc. I was getting random crashes no matter if I used Gen 1 or Gen 2. 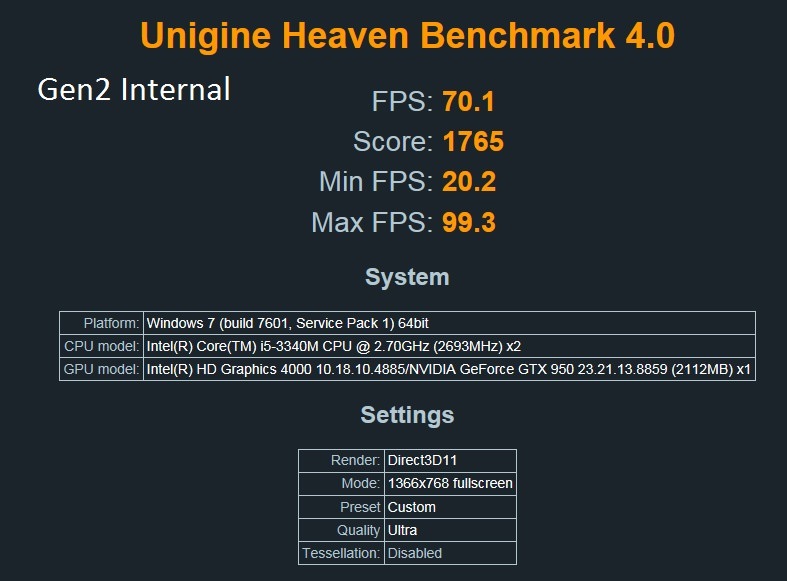 I have now put it down to the fact that my GTX950 is overclocked as standard so have underclocked it and that seems to have made quite a difference, still get the odd crash but it can be after a few hours gaming in Gen 2, I think the crashes are just a way to stop me playing games and go do something more productive!I set the power supply to be on all the time by switching one of the switches in the EXP GDC. I boot my laptop until it shows my Windows 7/setup 1.35 screen then I plug my expresscard in. I wrapped the cable from the EXP GDC in tin foil as had read that it improves stability, I then put cable wrap around it because its such a thin cable I was wary of it being damaged. Fitted everything in a housing which is much tidier than having all the wires coming from the power supply. I have used the internal monitor aswell as an external one. The internal one doesn’t run as fast but its still very playable. 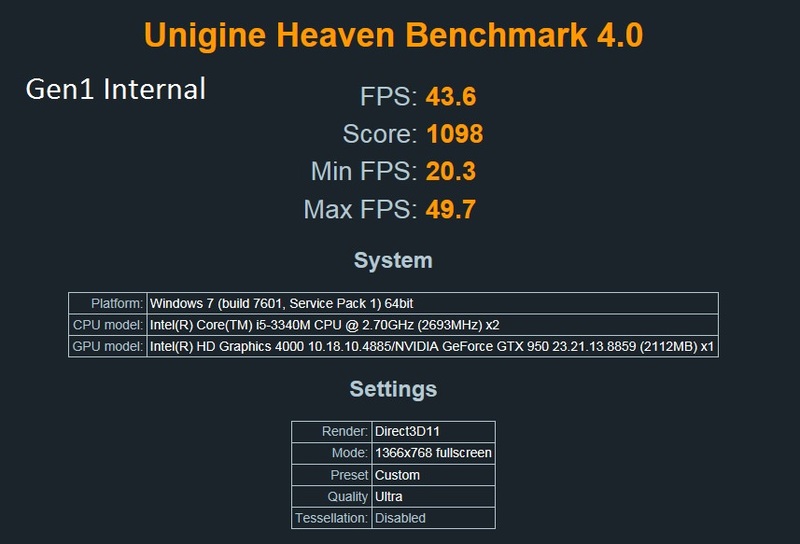 I have attached photos of my benchmarks. 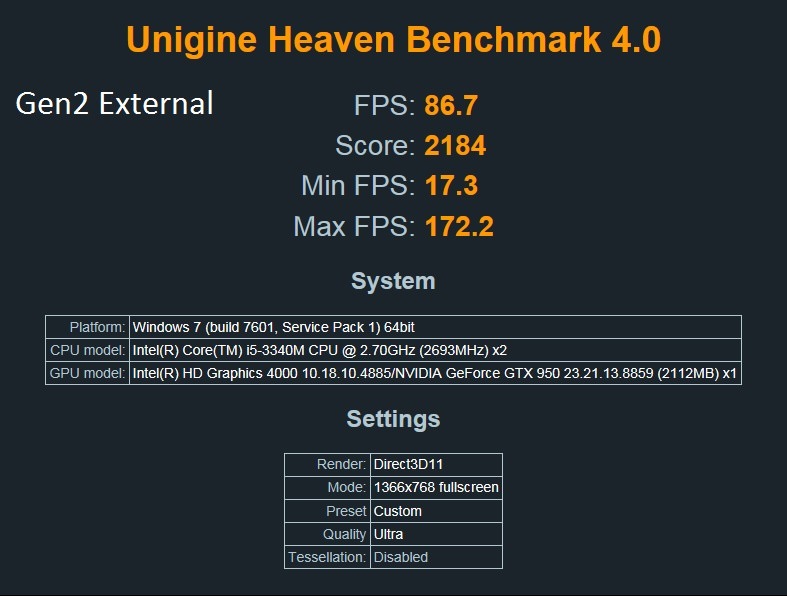 Gameplay is remarkable compared to the Intel HD4000 which I am accustomed to. Very happy with the device indeed.I like being able to take the laptop around with me and work on things then if I want a game just plug my egpu in. That is a lovely setup. That housing that you made looks good. It looks like somewhat that you would get in a shop. Thanks, I actually had a lot of fun making it, I wanted it to look like something bought in a shop. 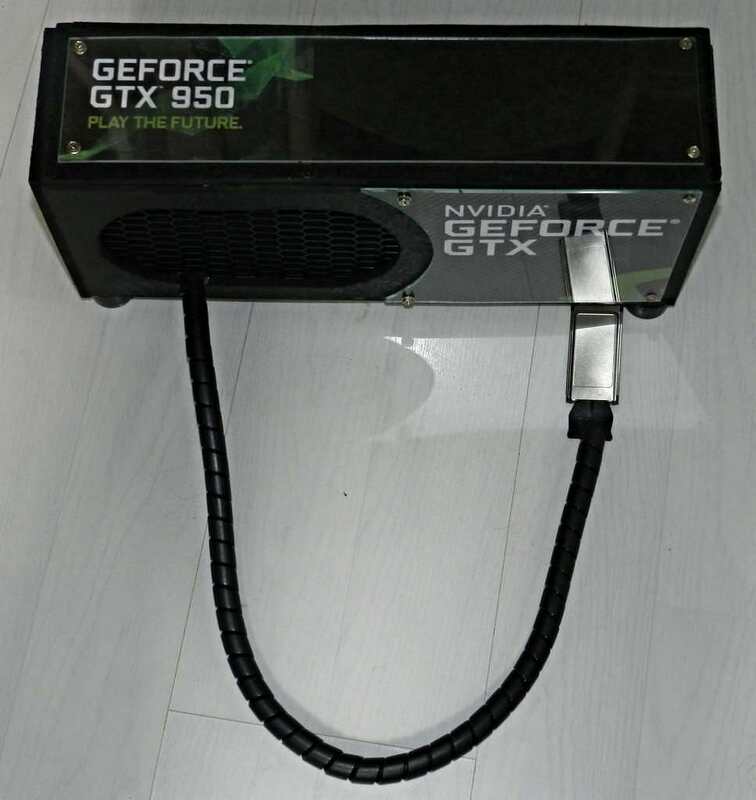 To make it slim and be the best arrangement of power supply and graphics card, I laid the power supply on its side. I bought a sheet of 5mm MDF. I cut out the 5 panels needed to make the box with a jigsaw. I then glued 4 of the panels to the powersupply with "No More Nails" glue. The mass of wires coming from the power supply was a problem because there wasn't enough space for them so I simply cut the ones I didn't need right back to as far as I could. The grill was actually some left over grill that I had ordered for the front of my car. 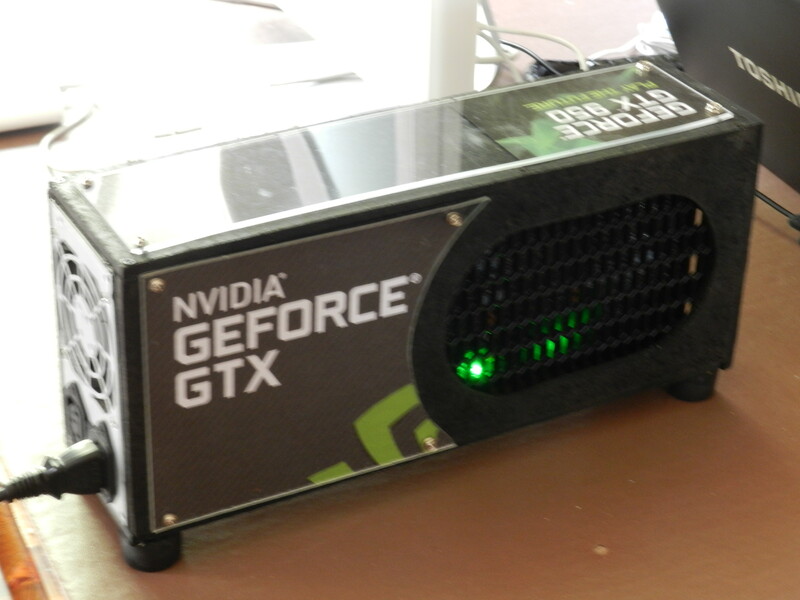 The one thing I would do different is I should have made a grill for the top of the graphics card as heat rises. I glued everything together and secured it with small countersunk screws. I sprayed the box black and although it looked ok it was a bit drab so I cut out perspex panels to give it a bit of shine. Printed the graphics on paper and cut them out to go behind the perspex. Secured the perspex with screws. It was a bit worrying when I switched it on at first because I had no way of knowing that the mass of wires inside that I had cut back weren't touching each other and going to blow the power supply, (Didnt fancy opening the box after gluing everything together. )but when it came to it, it worked fine. 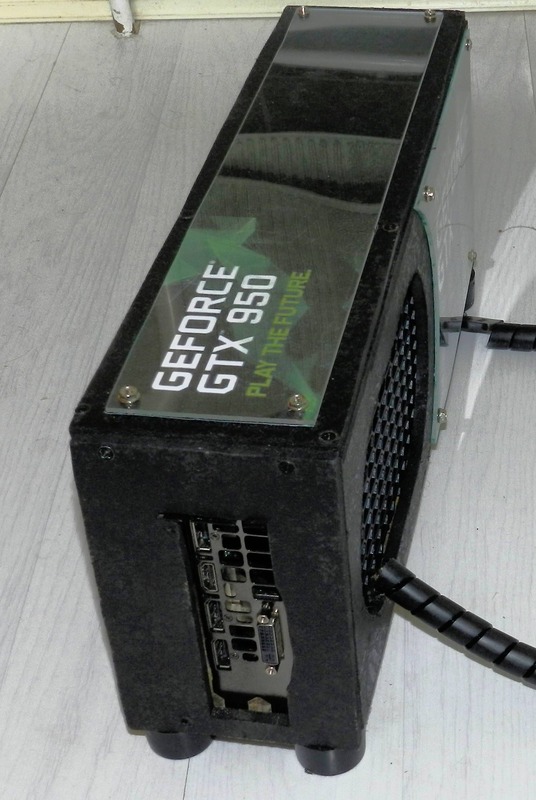 The fact that the casing has been glued to the power supply has made it really solid. I was actually surprised how solid it feels when you pick it up. Think in the future I might make the whole side covered in perspex and also countersink the screws. Had a look at your website MýnÆnglishTáwk I can't believe the amount of things you have built! you must have been very busy. I thought your lamp was good. A nice shell for the lid of your Laptop would finish it good. What about some plastic containers you get in the shops? maybe one of them could fit your lid? might be tricky fixing it to the lid though. You are at a much higher standard for electronics than me, I'm trying to learn more. Thank you well for having a look! Yea, it has taken a lot of work to make all of that over the years but it was worth it I think. I am glad that you like the light! I have made a shell for the laptop's lid now. I made it with a tin box as well as some plastic that I had. The tin box is what houses the video board. I cut a hole in the tin ond put a grill into it so that the blower has room to breathe. Those plastic boxes work well for building things too. They are see-through, which is great for that you can see what you have made inside. 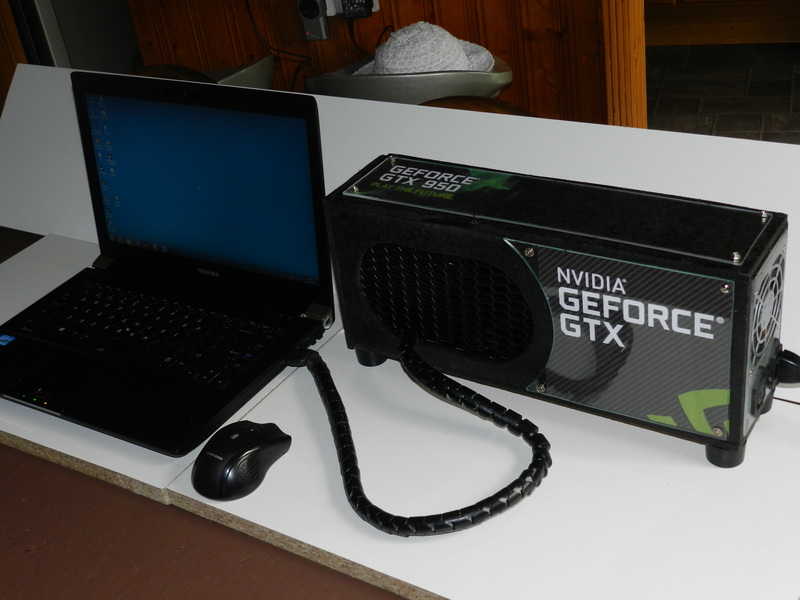 I will put some new shots of the laptop onto my webside soon; it is fully done now. I think that your standard is good too! If I knew no better, I would think that your video board box was shop bought. If it is the first thing that you have made, then it is a great start!